Although it’s a quite recent poker variant, Omaha has become very popular among casino players. Omaha and Hold’em poker share a few similarities with the main exception that players get dealt 4-hole cards instead of 2. To learn how to play Omaha poker gamblers should just simply study this brief guide and enjoy the thrill of the game. What is the Objective of Omaha? 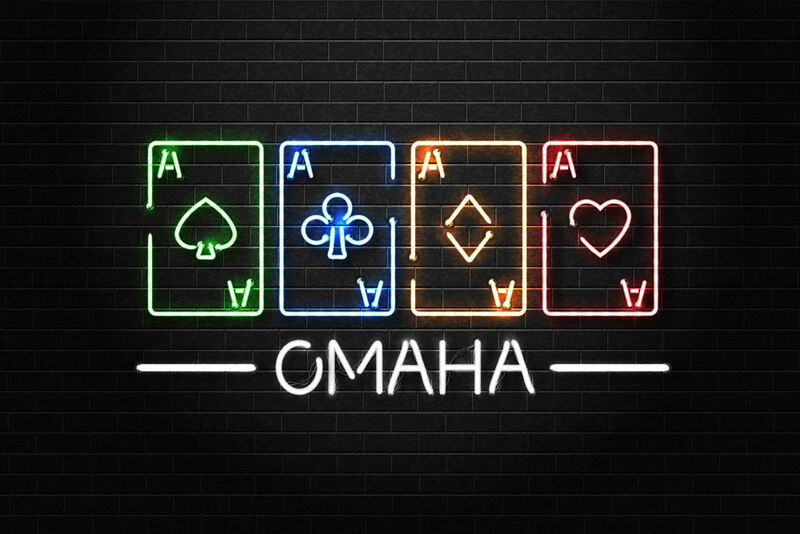 The objective of Omaha Poker is to reach the highest 5-card combination of the hole and community dealt cards on the table. The distinction to Texas Hold’em is that in Omaha players can only use 2 of the 4-hole cards and 3 community cards to achieve the winning hand. Omaha Poker can be played by between 2 to 10 players using a standard international 52-card pack. Previously to dealing the cards, the small and big blinds should be placed by the 2 players on the dealer’s left side. The first player on the left side of the dealer puts down the lower blind and the immediately next player puts down the big blind. Omaha and Hold’em rules have a few common features but players should understand what distinguishes the two poker games to guarantee their winning. When the blinds are down, the cards are dealt clockwise starting from the player sitting on the left side of the dealer. Each player receives 4 cards facing down. When the dealing of cards is completed, the first round of betting begins during the preflop. The bets begin. What is a betting round? A betting round means that all players have acted and that all betting players have placed the same bet for the round. A player can choose to fold, meaning he throws his cards and doesn’t place a bet, to call, meaning that he matches the big blind or to raise, meaning that he increases the amount of money to a value equal to minimum the double of the big blind. Limits on the raise depend on the variant of the Omaha poker which is being played. The player on the left side of the big blind starts the betting round which continues in a clockwise progression. The amount of the raise or call depends on the last bet made during the round. When the turn to bet comes back to the player who set the small blind, that player can either fold, call or raise the stakes. When everyone has placed a bet, the pre-flop round ends. Now, the flop will be dealt. This includes the first 3 of the 5 community cards being dealt. The dealer leaves out the first card of the deck facing down, respectively the burn card, and deals 3 cards face up. The same betting round like in the pre-flop begins with the player sitting on the left side of the dealer. During this round, a bet is usually equal to the big blind. When betting during the flop round is finished, the dealer begins the turn. Another card is set facing up along with the rest of the community cards. The next betting round begins and the only difference to the flop betting round is that a larger betting limit is used and equals to double of the big blind’s value. When betting during the turn round finishes, the River Round begins and the dealer sets the final card face up on the table. Another betting session begins in the same maner as during the turn round. The showdown begins after betting on the River round is completed. The player who has the highest value hand is the winner of the pot during the showdown. What is a Winning Hand in Omaha? First, you need to know the winning hand order including the Royal Flush, Straight Flush, Four of a Kind, Full House, Flush, Straight, Three of A Kind, Two Pair, One Pair, and High Card. In Omaha having 3 pairs means only 2 pairs with the highest value 2 pairs making up the hand. Players can use only 2 hole cards and three community dealt cards to make up their hand. If players don’t have any cards to make up any winning combination, then the hand with the card of highest value wins the pot. In Omaha, a more aggressive approach is recommended when playing. If you wait to use your hand to check what the other players will do, then you’re risking that the combination you’re aiming for will be reached by any other player. It’s a game for players who can show their cards in a flash. Bluffing your opponent is another good tactic to use because all players have multiple cards which they can use to combine with the community cards. Others may call the bet or even raise the stakes. Players shouldn’t get overwhelmed by the aces. Usually, when they have an ace in their hand, players tend to play carelessly which could result in overlooking initial strategies. Create a visual image of your cards in your mind by immediately memorizing them and play around with combinations without constantly checking the cards which could tip of other players that you’re not confident about your hand. Poker enthusiasts can play Omaha and Hold’em online in many variations including No Limit Texas Hold’em, Pot Limit Hold’em, Mixed Texas Hold’em, Omaha Hi/Lo, Omaha-8 Encore and Half & Half Double Omaha. Like with any gambling, responsible playing is highly recommended. Players should avoid No Limit Omaha games because the increased dynamics of this poker variant are so high it’s easy to get lost in the excitement. Strategy and structure should be the cornerstones of any aspiring poker winner. Previous:A Beginners Guide to Playing Poker!